A multi-faith memorial service in honor of Orlando massacre victims was held at South Reno United Methodist Church (SRUMC) in Reno (Nevada, USA) on June 15 evening. Organized by distinguished religious statesman Rajan Zed and hosted by SRUMC, it included prayers/thoughts/songs by area Christian, Muslim, Hindu, Buddhist, Jewish, Baha’i, Native American, Pagan, etc., leaders, besides others. This multi-faith service paid tribute to all victims, their families, first responders and others touched by this tragedy. A lamp was lighted by various religious and other leaders on the occasion. Besides Zed, who is President of Universal Society of Hinduism, those who prayed/spoke/sang on the occasion included Dawn M. Flower, Senior Pastor of SRUMC; Mark J. Fasman, Rabbi of Congregation Temple Emanu-El; Teresa Benitez-Thompson, Nevada Assemblywoman and Co-Assistant Minority Floor Leader; Abdul Rahim Barghouthi, Acting Imam of Northern Nevada Muslim Community; Matthew E. Goddard, Meditation Guide at Reno Buddhist Center; Sean Savoy, Director of Nevada Interfaith Coalition for Equality and Inclusion; Chuck Allen, Washoe County Sheriff; Rigoberto Ruano Mireles, Deacon at Saint Therese Church of the Little Flower; Patricia F. Meidell, Community Relations, The Church of Jesus Christ of Latter-day Saints; Gwenyfur Draigtanllwyth, High Priestess, Gathering WIND (witches in Nevada’s desert); Brian E. Melendez, American Indian Spirituality Scholar; Spirit Singers lead by Leslie A. Fudge; Steve W. Wren, Pastor of First Christian Church of Sparks; Justin V. Deverse, Baha’i teacher; and Clayton Brent Hoy-Bianchi, Chaplain at Renown Health. U.S. Senate Democratic Leader Senator Harry Reid and Nevada Secretary of State Barbara K. Cegavske sent remarks for the occasion. Rajan Zed, who opened the service with prayers form Rig-Veda, oldest existing scripture of the mankind; and Taittiriya Upanishad, another ancient Hindu scripture; noted: We want to show that religious leaders of diverse traditions in Northern Nevada are united in their mourning and support for the victims, their families and others affected by this tragic loss. 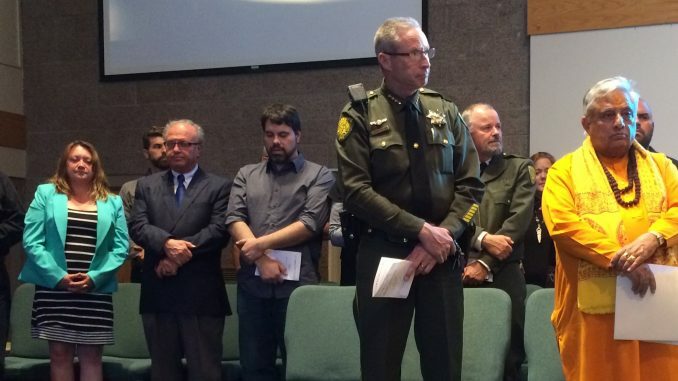 Zed further said: We, the faith leaders of Northern Nevada, strongly condemn any and all acts of violence against innocent people. We are deeply saddened by this tragedy and our hearts go out to the victims and their families. It was a senseless and shocking violence. We, as people of faith, despite our seriously different traditions, must take a stand against violence by coming together with kindness and love, Rajan Zed added. SRUMC, whose tagline is “Open Hearts, Open Minds, Open Doors”, was officially chartered in 1989. Is Poor Economy to Blame for Rise in Diaper Rash?